Veteran’s Day, 1968. An excerpt from Those Who Remain: Remembrance and Reunion after War. 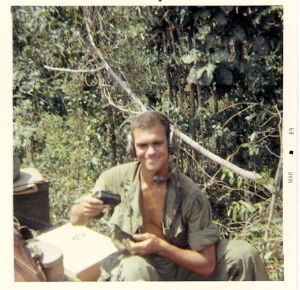 He spoke of his time in Vietnam as unavoidable, a river to cross, an obstacle to remove. Once the orders are issued, he said he would face court martial if he didn’t go. “There’s no other choice,” he said. “I have to go even if Dad says the war is a mess right now.” What his father had said was that there was a disconnect between what was happening on the ground, in the jungles, and what politicians and the Pentagon perceived the war to be and expected it to be, a reality which would not be unraveled from the fundamental untruths and hyperbole of the war until years later. But, I understood nothing about what he was about to step into. I promised to write every day and prayed for the rash to go away. The anticipation of verbal silence, physical distance, had its own power. It began slowly with long silences and idle activities, constant unspoken preparation. We could drive for an hour together without a word between us. We unpacked and repacked, organized cleaned, straightened, made lists. 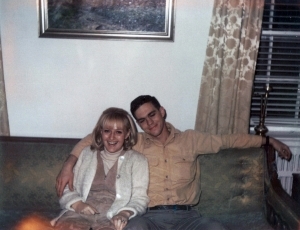 On our last night together on November 10, 1968 we barely spoke. We expressed our love for each other only with our bodies. The poison ivy scourge had finally resolved. I remember tenderness and pleasure and the sense that he was giving more than I could give back. It was the best and worst night of our marriage. Perhaps in our silences we were rehearsing; letters, slides and photographs would be our only connection for months. The next morning – a Tuesday and by chance also Veteran’s Day – at 5:00am, there was a quiet breakfast of his favorites, bacon and eggs. My father drove with us the ten-minute ride to a small local airport in Groton, Connecticut. Dave and I sat hand in hand in a corridor designated as the airport terminal with high windows casting frail shadows of the window frames around us in the gray, morning light. Every cough and footstep echoed off the drab, beige, industrial-looking, concrete block walls. We were the only customers. Clouds and a light rain obliterated the transition from sunrise to daylight. A toy-sized prop plane waited in the mist on the tarmac. It would take him back to McGuire Air Force Base in New Jersey where he would find an army transport plane heading to another base in California. From there he would fly farther and farther west until it became east again, with brief stops in Hawaii, the Philippines, finally to arrive in Saigon. As we sat together on the metal bench it seemed that nothing more could be said. Words were too precious, too insignificant. We made small talk, small jokes. We spoke in fragments as if we were in a hospital waiting room anticipating news of the patient’s condition. My fingers entwined in his, I glanced around the cinder block walls, not for the purpose of remembering this place, but for reassurance that we would be here again, we would meet next year in this spot. A door to the outside opened, someone looked in glancing left and right, and the whir of the engines outside filled the room. I remembered the string of pearls his father brought back from Vietnam for his mother two years before. What a clever, sweet way to say, “I’ll be back,” and suddenly he was leaving. My father and I watched him duck his head under the light rain as he strode across the runway and handed his bag up to a hand reaching down from the door of the plane. He smiled back at us and waved. He was wearing civilian clothes. The plane taxied into the rain and flew off over Long Island Sound. I looked away quickly from my father’s sadness as he took out a handkerchief and wiped his face. “Well – he’s on his way – the sooner to come back,” he said.